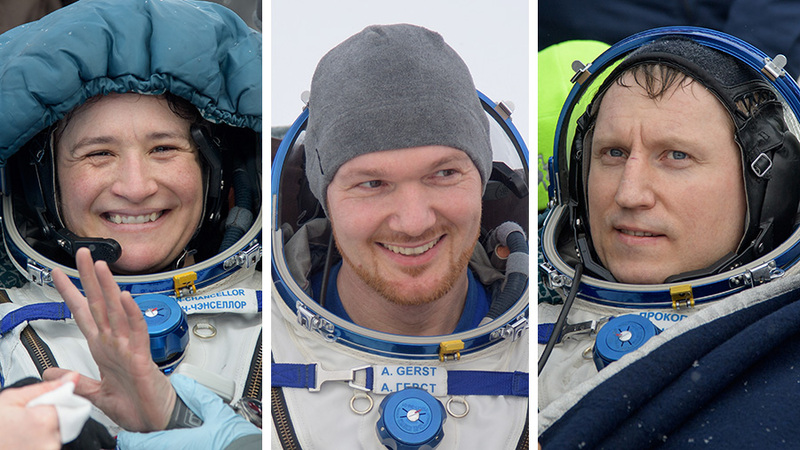 Auñón-Chancellor and her crewmates, Expedition 57 Commander Alexander Gerst of ESA (European Space Agency) and Soyuz commander Sergey Prokopyev, launched June 6 and arrived at the space station two days later to begin their mission. The Expedition 57 crew contributed to hundreds of experiments in biology, biotechnology, physical science and Earth science aboard the world-class orbiting laboratory. Highlights included investigations into new cancer treatment methods and algae growth in space. The crew also installed a new Life Sciences Glovebox, a sealed work area for life science and technology investigations that can accommodate two astronauts. During the 197 days, they circled the globe 3,152 times, covering 83.3 million miles. This was the first flight for Auñón-Chancellor and Prokopyev and the second for Gerst, who – with a total of 362 days in orbit – now holds the flight duration record among ESA astronauts. 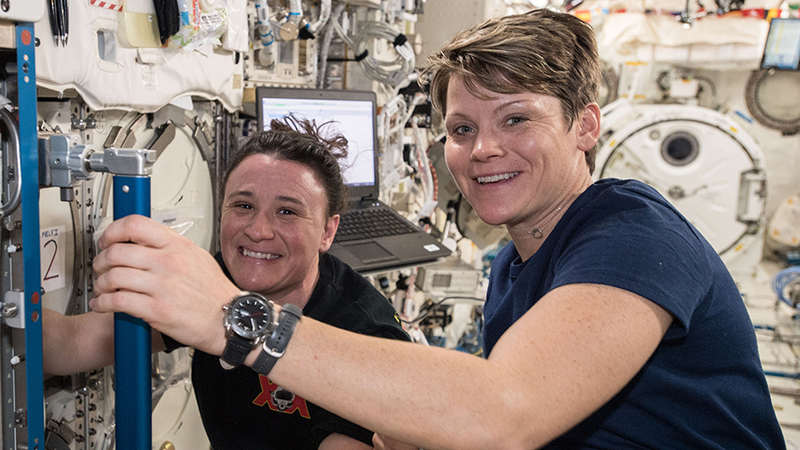 For the last 16 days of her mission, Auñón-Chancellor was joined by fellow NASA astronaut Anne McClain, marking the first time in which the only two U.S. astronauts on a mission were both women. Prokopyev completed two spacewalks totaling 15 hours and 31 minutes. He and Oleg Artemyev of Roscosmos launched four small technology satellites and installed an experiment during a spacewalk Aug. 15. Then during a 7 hour, 45 minute spacewalk Dec. 11, he and Oleg Kononenko of Roscosmos retrieved patch samples and took digital images of a repair made to the habitation module of the Soyuz MS-09 in which the Expedition 57 trio rode home. The space station crew located and, within hours of its detection, repaired a small hole inside the Soyuz in August. The spacecraft was thoroughly checked and deemed safe for return to Earth. 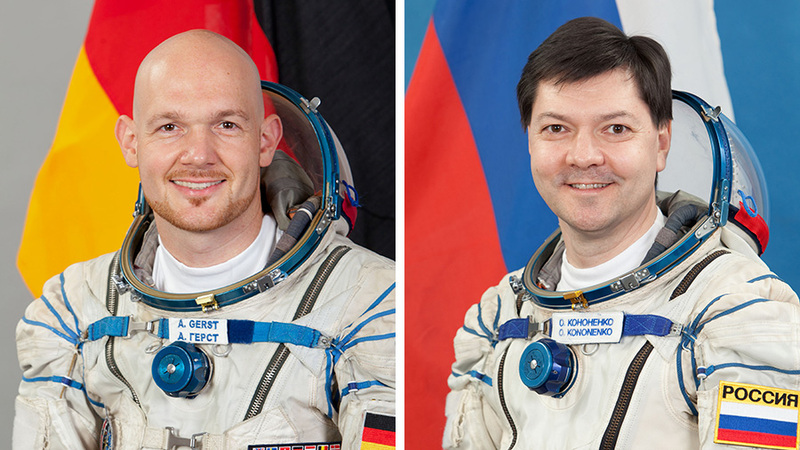 Auñón-Chancellor will return home to Houston, Gerst will return to Cologne, Germany, and Prokopyev will return to Star City, Russia, following post-landing medical checks and research activities. The Expedition 58 crew continues operating the station, with Oleg Kononenko of Roscosmos in command. 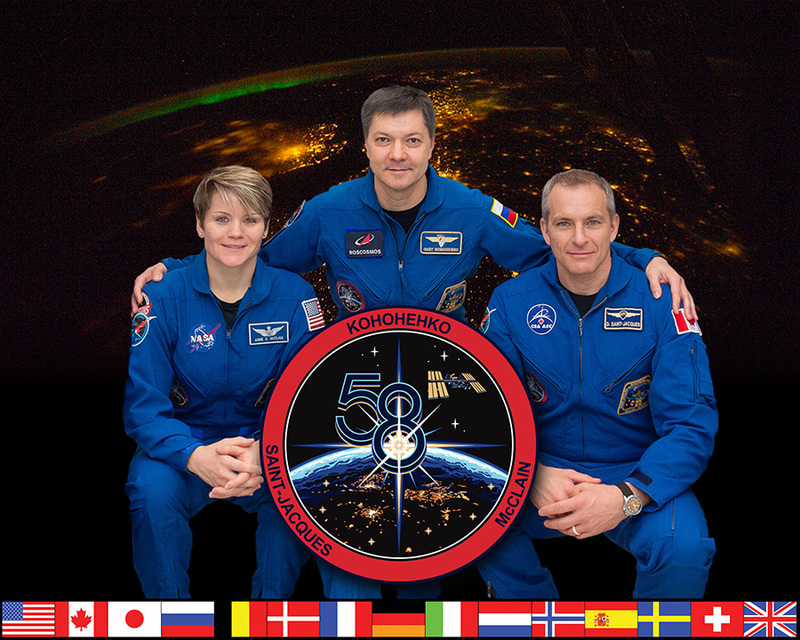 Along with his crewmates Anne McClain of NASA and David Saint-Jacques of the Canadian Space Agency, the three-person crew will operate the station for a little more than two months until three additional crew members launch Feb. 28, 2019 to join them. For news and more information about the mission, visit http://www.nasa.gov/station and https://blogs.nasa.gov/spacestation/. Get space station news, images and features via social media on Instagram at: @iss, ISS on Facebook, and on Twitter @Space_Station and @ISS_Research. 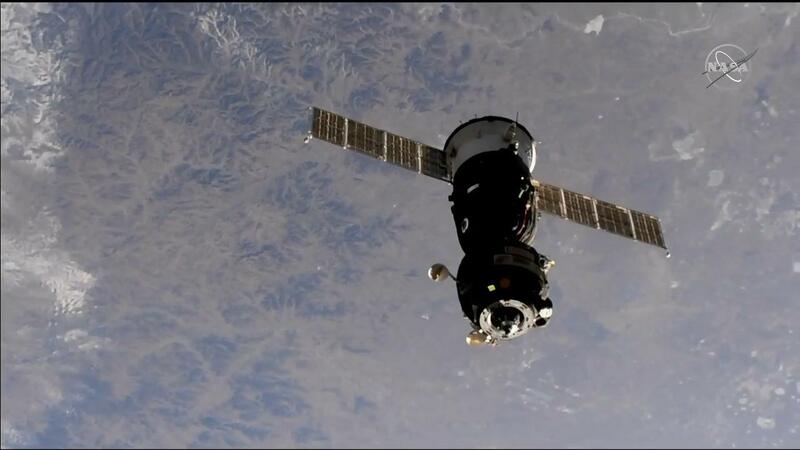 The Soyuz MS-09 crew spacecraft from Roscosmos is pictured after undocking from the International Space Station’s Rassvet module as both spacecraft orbited over southeast Mongolia..
For landing coverage and more information about the mission, visit: https://blogs.nasa.gov/spacestation/. Get space station news, images and features via social media on Instagram at: @iss, ISS on Facebook, and on Twitter @Space_Station and @ISS_Research. Expedition 57 crew members (from left) Serena Auñón-Chancellor of NASA, Alexander Gerst of ESA (European Space Agency) and Sergey Prokopyev of Roscosmos prepare to board their Soyuz MS-09 spacecraft. At 5:30 p.m. EST, the hatch closed between the Soyuz spacecraft and the International Space Station in preparation for undocking. NASA Flight Engineer Serena Auñón-Chancellor, Expedition 57 Commander Alexander Gerst of ESA (European Space Agency) and Soyuz commander Sergey Prokopyev of the Russian space agency Roscosmos are scheduled to undock their Soyuz at 8:40 p.m.
NASA Television will air live coverage of the undocking beginning at 7:45 p.m.
Their landing in Kazakhstan is targeted for approximately 12:03 a.m. Thursday (11:03 a.m. Kazakhstan time) and will conclude a more than six month mission conducting science and maintenance aboard the space station, in which they circled the globe 3,152 times, covering 83.3 million miles. Astronaut Alexander Gerst (left) handed over station command today to cosmonaut Oleg Kononenko. The Expedition 57 commander handed over control of the International Space Station today in a traditional ceremony. He and two of his crewmates will then head back to Earth Wednesday just in time for the holidays. Commander Alexander Gerst ceremonially transferred command of the orbital lab today to cosmonaut Oleg Kononenko who officially begins his lead of the station when the homebound crew undocks tomorrow. Kononenko is staying behind with Expedition 58 Flight Engineers Anne McClain and David Saint-Jacques who will stay on the station until June. Gerst and Flight Engineers Serena Auñón-Chancellor and Sergey Prokopyev are winding down their 197-day mission in space. The trio will undock from the Rassvet module inside the Soyuz MS-09 spacecraft Wednesday at 8:40 p.m. and parachute to a landing in Kazakhstan about three-and-a-half hours later. Prokopyev will command the Soyuz flight back to Earth tomorrow flanked by Gerst and Auñón-Chancellor. Today he is packing and readying the spacecraft for the departure. The undocking and landing activities will be broadcast live on NASA TV. There was still time for science on the orbital lab today as Gerst explored how astronauts manipulate objects in space. Results could improve the design of space habitats and impact neurology patients on Earth. He also joined Auñón-Chancellor for ultrasound scans and blood sample collections as they wrap up their human research studies. Auñón-Chancellor spent Thursday working with a variety of research gear supporting space biology. She processed research samples today in the NanoRacks Plate Reader that enables pharmaceutical and biotechnology science in space. She also stowed biological samples in a science freezer for a cellular adaptation study. The newest trio aboard the station that arrived last week are hard at work today on human research and getting up to speed on station systems. Flight Engineers Anne McClain and David Saint-Jacques collected blood and urine samples to be analyzed for the Biochemical Profile space adaptation study. 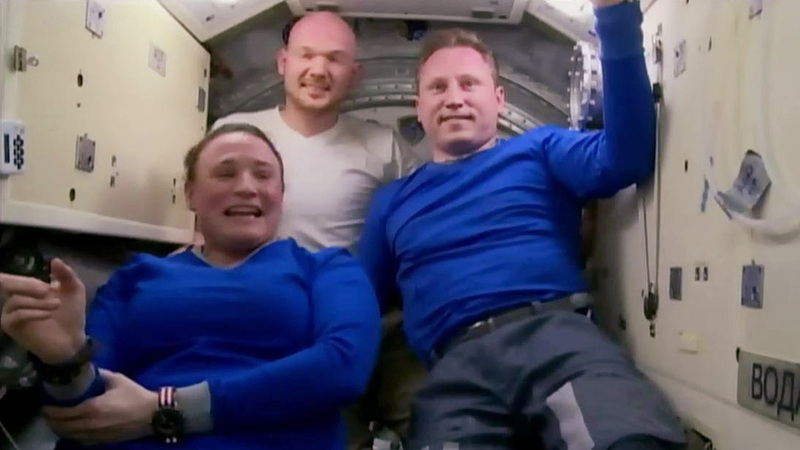 The duo also scheduled some time today to get used to life in space. Four-time station cosmonaut Oleg Kononenko joined Prokopyev for more spacesuit maintenance after Tuesday’s spacewalk. Alexander Gerst and Serena Auñón-Chancellor drew their own blood samples today and processed them in the Human Research Facility’s centrifuge. The samples were then coagulated and stowed in a science freezer for later analysis. The Biochemical Profile is a long-running study on astronauts and is providing insight into the human body’s adaptation to living in space. Gerst is also packing the Soyuz spacecraft that will take him, Auñón-Chancellor and Prokopyev back to Earth Dec. 19. 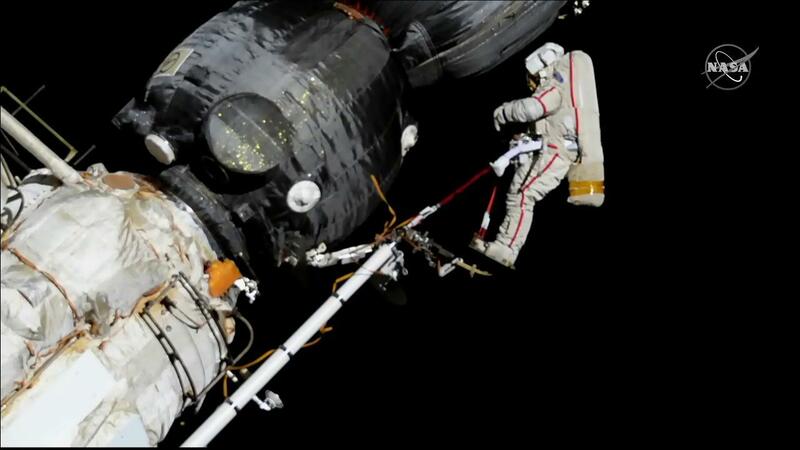 This is the same spaceship that was inspected Tuesday by the two Russian spacewalkers. The station’s newest astronauts Anne McClain and David Saint-Jacques are still getting used to their new home in space. The pair also went about the day working on a variety of maintenance and research. 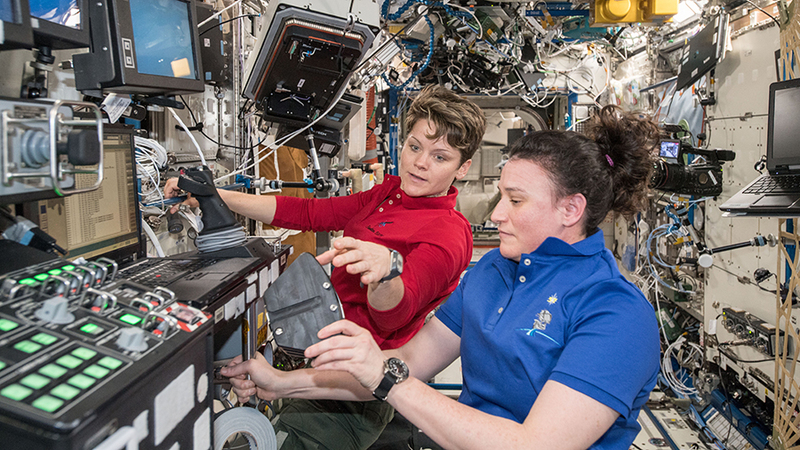 McClain strapped on an armband monitoring how her body adapts to orbiting Earth 16 times a day after setting up research hardware for two separate experiments. Saint-Jacques deployed over a dozen radiation monitors throughout the station today before some light plumbing work with Gerst in the orbital restroom. Spacewalker Oleg Kononenko is on the Strela boom getting ready for inspection work on the Soyuz crew vehicle. Expedition 57 Flight Engineers Oleg Kononenko and Sergey Prokopyev of Roscosmos completed a spacewalk lasting 7 hours and 45 minutes. The two cosmonauts opened the hatch to the Pirs docking compartment to begin the spacewalk at 10:59 a.m. EST. They re-entered the airlock and closed the hatch at 6:44 p.m. EST. During the spacewalk, the two examined the external hull of the Russian Soyuz MS-09 spacecraft attached to the space station, took images, and applied a thermal blanket. They also retrieved science experiments from the Rassvet module before heading back inside. It was the 213th spacewalk in support of International Space Station assembly, maintenance and upgrades, the fourth for Kononenko, and the second for Prokopyev. 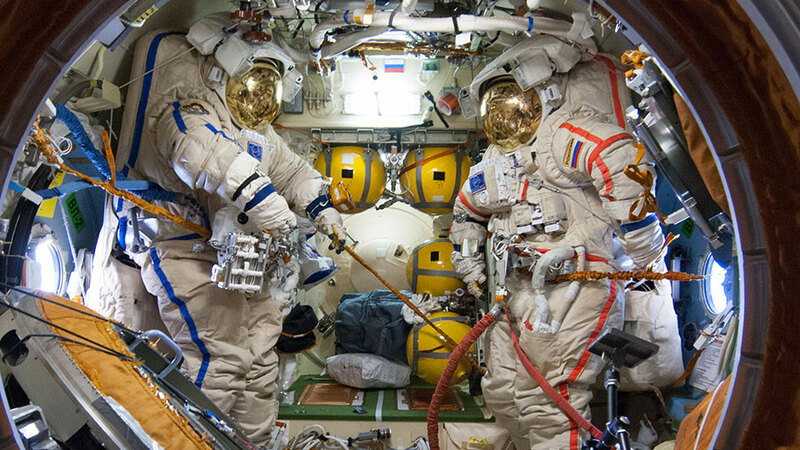 A pair of empty Orlan spacesuits are seen inside the Pirs Docking Compartment airlock where cosmonauts stage Russian spacewalks. Expedition 57 Flight Engineers Oleg Kononenko and Sergey Prokopyev of Roscosmos began a spacewalk when they opened the hatch of the Pirs docking compartment of the International Space Station at 10:59 a.m. EST. Kononenko, on his fourth spacewalk today, is designated extravehicular crew member 1 (EV1), and is wearing a spacesuit bearing red stripes. Prokopyev, on his second spacewalk, is wearing blue stripes and is designated extravehicular crew member 2 (EV2). Coverage of the spacewalk continues on NASA Television and the agency’s website. 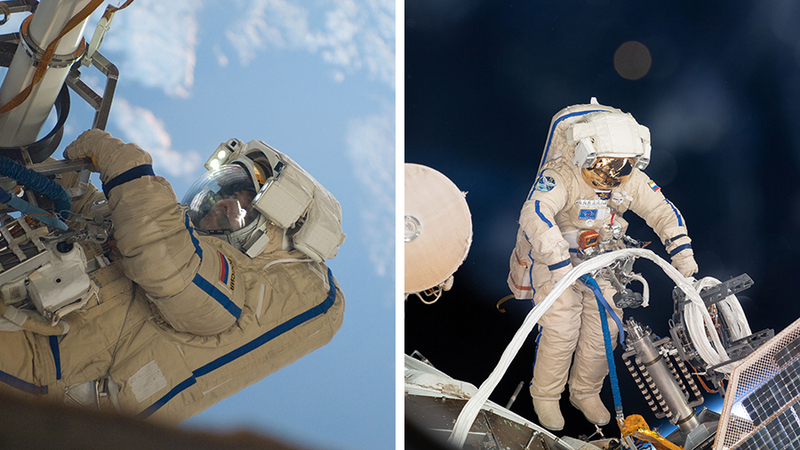 Spacewalkers Oleg Kononenko (left pic from February 2012) and Sergey Prokopyev (right pic from August 2018) will examine the Soyuz MS-09 spacecraft that will return three Expedition 57 crew members to Earth Dec. 19. Expedition 57 Flight Engineers Oleg Kononenko and Sergey Prokopyev of Roscosmos are preparing to venture outside the International Space Station for a spacewalk at approximately 11 a.m. EST on Tuesday, Dec. 11. NASA Television coverage is now underway and available on the agency’s website. Over the course of about six hours, the duo will use this spacewalk to examine a section of the external hull of the Soyuz MS-09 spacecraft currently docked to station, and if time permits, retrieve external experiments. In late August, a pressure leak occurred from the space station that was traced to the Soyuz. Within hours after finding the source of the leak, crew members sealed the hole and the station has since maintained steady pressure. The cosmonauts will take samples of any residue found on the hull and take digital images of the area before placing a new thermal blanket over it. The samples and images will provide additional information that will aid the investigation in the cause of the pressure leak.